Trutex are one of the leading schoolwear creators in the UK and have been supplying uniforms to the public since 1865. They specialise in school uniforms for a large number of primary and secondary schools and supply to schools, trade and direct to the public through their stores. 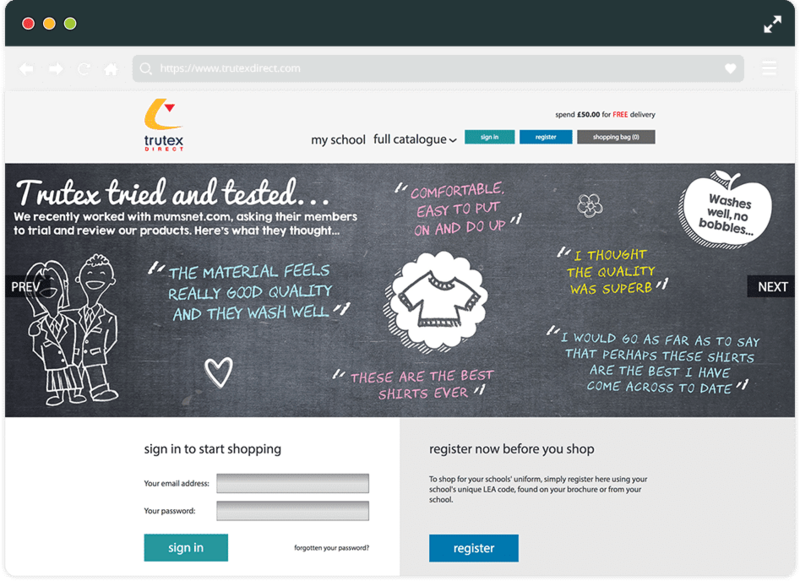 Trutex Direct specifically is their offering to allow parents to purchase compulsory badged uniforms for their children's school. Their existing site was retroactively made responsive including checkout and login areas. This change was vital to allow mobile using parents to browse and purchase their children's required schoolwear. Mobile traffic has continued to climb since this change was made. Bounce rates for mobile dropped by 8% when we updated the site, as well as mobile conversion rate increasing by 85%. The main objective for Trutex was to integrate their systems to make the site easier to update and maintain. When we became their Magento partner in 2014 as well as integrate these systems, the initial task was to make the site responsive due to a large increase in mobile sessions on the site. To measure the success of the new responsive nature of the site Trutex were keen to see a large increase in mobile conversions and reduction in contact to their customer service from mobile users.